Progs are shitting their pants. Always remember polls said Mrs. Clinton would be POTUS. Looks like Lil Potato is in full self-destruct mode. March 19, 2018 – The passage of time appears to have done nothing to soothe Canadian voters irritated with Prime Minister Justin Trudeau since his highly criticized passage to India last month. Poor JT - he fall down & go BOOM! Trudeau's Liberals did not exactly sweep the place last time. He has never had majority support but parties seldom do in the Canadian system. cons at 30% is a win? That must mean being a right wing moron is normal. Is this saying that 30% of the Canadian population is still completely and utterly retarded ? Anyone who voted for Dopey should be ashamed of themselves. The DELUGE last year eh. Yeah...but 30%? That's a pretty significant core group who apparently are still happy with perpetual deficit spending and prefer having an embarrassingly self absorbed, mocking, fake, hypocritical, pretentious, narcissistic douche at the helm. 30% is still surprising to me, and given the capricious nature of voters, wouldn't surprise me if he regains some of the ground he's lost recently. I'm sure the adults in the room have had a very sober, in depth discussion regarding his recent behavior and have a game plan on how to better control their fool. Liberals don't roll over easily, particularly when power and control of the country is at stake...even when the attack comes from within and the damage is self-inflicted. I have a feeling Pinocchio's strings are going to be re-attached, post-haste. Some folks are (and always will be) life long party members regardless of good times or bad. NDP, Cons or Libs - doesn't matter, they will always vote that way. Also, these politicians are fully aware that they can generate traction from certain demographics based on crafting policies to appease them.... Healthcare and education (especially post secondary) are 2 that come to mind relative to reaching out directly to seniors and 20-somethings that may be more inclined to vote based on a single (or small # of) issue(s). Sounds like it's time to vote for inanimate carbon rod. It would be an improvement for the post of Premier of Ontario. Should Mental Floss change his moniker to Mentally F**ked? But in an interview on Tuesday with Paul Wells—in front of a live audience at the National Arts Centre in Ottawa—Scheer delineated a not-too-distant future in which he is Prime Minister. The day earlier, an Angus Reid opinion poll showed Scheer ahead of Justin Trudeau by 13 percentage points, and his confidence came out in the form of imagination. On the first day of Spring, at his highest personal ratings yet, in a room enclosed by 16 glass window panels and two sets of glass doors, an assured Scheer peered into his glass ball. Scheer did not flatly rule out working with the NDP after the next election in a minority situation “to try to make Parliament work”. I'm looking forward to Andrew as PM. Considering you and mentalfloss are left wing, the evidence indicates you have the "moron" arrow pointed 180 degrees off target on the political spectrum. Flosshole is a closet Dipper but won't bring it up in public. I guess he is ashamed? Flossy and Waldo go to the same high school. They're kids. Kids that probsbly don't do well in school. They troll threads trying to be cool. I hope the polls continue that way. Politics in Canada is a back and forth thing. 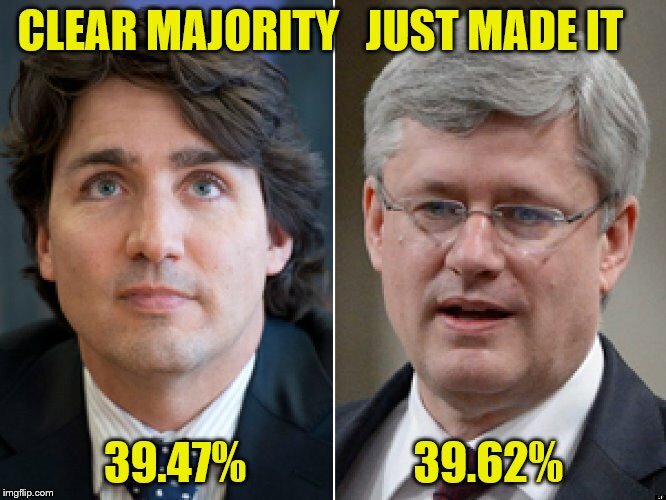 Trudeau's popularity should be slipping. Between approving the Kinder Morgan pipeline and selling arms to Saudi Arabia he ought to have lost half his base. He's fully full of Internet bravery. He feels that he cannot be discovered and says things he would not say to anyone, except Waldo maybe. It's his immaturity. He should grow out of it. Last edited by Murphy; Mar 25th, 2018 at 01:29 PM..
We'll have to wait for the next volley of polls. Nothing of any value until closer to the election. In the meantime Trudeau keeps piling on the bad press. Last edited by Murphy; Mar 25th, 2018 at 01:37 PM.. I mean nobody actually thinks anyone is voting for the conservatives do they? They are voting against the liberals. That is the best the conservatives can hope for. That is how Harper became PM. When the Conservatives form the government next year, they will reverse Trudeau's gun legislation. My dog would make a better P.M. than Trudeau!